Have you ever taken a picture with your BlackBerry that you really didn't want to show up when you (or your friends) browse your phone? Did you ever take a "private" picture that you sent to a special person, but want it hidden from plain sight? Whatever reason you may have (I'm not judging ;-) for wanting a picture, video or file hidden, here is how! The method is the same for a picture, video or file just the location of the file will change. Go in to your media folder, select pictures and locate the picture you wish to hide. Highlight the name of the file and press the menu key (BB button). 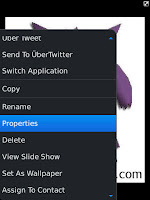 Select "properties". From here you will see all the file info, including name, size date created, and at the very bottom a small checkbox that says "hidden". To hide the file simply check this box. When you exit out of the folder the file will be hidden. Ok, now that we've hid it, lets go find it! 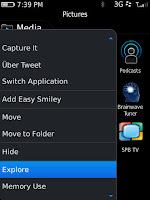 Open the media folder, push the menu button and select "explore". This opens a file browser similar to the last image attached. 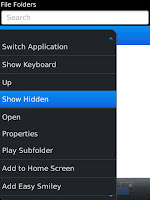 hit the menu button once more and select "show hidden". 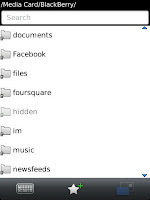 Now navigate through the folders and find your file. 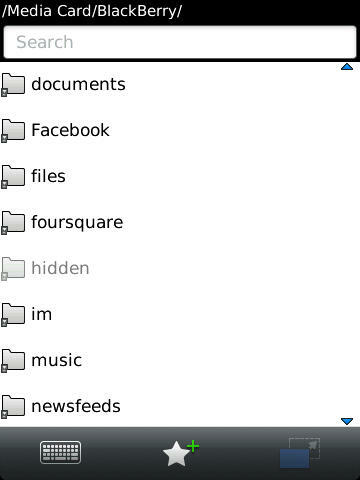 If it was a picture you hid it will be in either BlackBerry/pictures folder, or BlackBerry/camera folder on OS6 devices. A video will appear in the BlackBerry/video folder. Hi, I tried doing this with a pictures' folder and it worked reasonably well. However, when I view 'Media/Pictures/All pictures', the contents of this particular 'hidden' folder tend to show up there. Any idea how to prevent them from appearing in 'All pictures'? Try moving the folder you've hidden out of the pictures folder altogether. When I go into the Media area and click on explore, all that comes up is the area to click on Media Card and Device. I must be doing something wrong? No that's correct. You then have to navigate to media card/pictures or media/camera and look for your hidden picture. 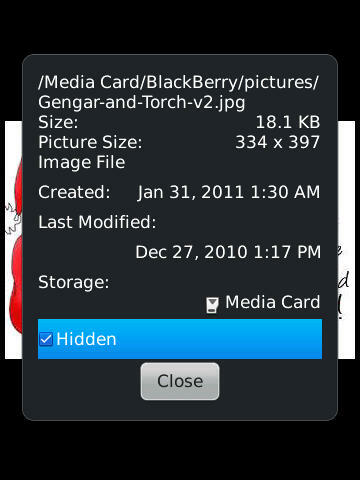 I have a hidden pictures folder on my media card/blackberry/pictures. I want to add pics from my media card to it but can not for the life of me figure out how. Best/easiest way is to hook your BlackBerry up to the computer. Drag and drop them into the hidden folder. I figured it out. I had to unhide the hidden folder first. Thanks!! You have to tell it computer to show hidden files.